BTC Commentary- Some people are finding it tougher and tougher to just let legal people, be legal. It's a fact, if you are a legal migrant, you are permitted to drive in this country. Hotel workers have spent the last year trying to organize a union at the Hilton Mission Valley and suddenly in late March when a new management company took over, the hotel began using E-verify. Hotel managers told the nine employees they had until Monday, April 8 or Tuesday, April 9 to fix problems with paperwork or face termination. That's why hotel workers, clergy and community activists are on the hunger strike. They are calling the hotel’s plan to fire the nine long-time hotel employees who the system flagged unfair. "We can't stand by as immigrant workers face firing after being subjected to the flawed and unfair E-Verify system." said Brigette Browning, President of UNITE HERE Local 30. "This hunger strike highlights that these workers and their families deserve the same opportunities to work and the same respect as all of San Diego's working families, and the community stands with them and all immigrant workers who face unfair treatment." A privacy watchdog has filed a lawsuit contending the U.S. Federal Bureau of Investigation has failed to provide requested technical information about a biometric identification database expected to be the largest in the world. "Through the date of this pleading, the FBI has not contacted EPIC again regarding the status of either of EPIC's two FOIA requests," EPIC said in its suit. iDoctor "Your body under surveillance by your cellphone"
BTC - "The new medicine is plugged into you," according to smart phone health data advocate Dr. Topol. "You can make it a lab on a chip." While it is amazing science, our forecast is that patients struggling with privacy and government run healthcare are not going to want their urine and STD tests broadcasted from the comfort of their cellphones. A proposed bill that would enable student IDs issued by Tennessee state colleges and universities to double at voting credentials has failed to pass. According to a report from TriCities.com, the House’s version of the bill — which does not allow the student IDs to double as voting credentials — was supported by a count of 23 to 7. Murfreesboro Republican Senator Bill Ketron, a proponent of the bill, has not given up hope and in fact plans to press on with the idea. Let’s see if we can summarize and overly-simplify the events leading up to today. For purposes of over-simplification, we’re skipping some things. 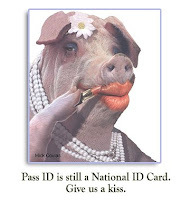 Congress passed the Real ID Act in 2005. It went into effect in May, 2008. It was enacted when there was much concern about illegal immigration and the possibility that terrorists might be getting into this country too easily. Bush II was still in office. Our troops were in Iraq. Homeland Security was telling us the terrorist level was at yellow or red. TSA people at airports every day started confiscating thousands of little Swiss Army pocket knives that had toothpicks, tweezers and little bitty scissors in them. 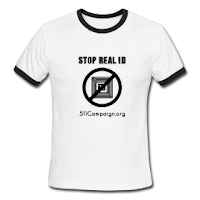 There are many words that can describe the Real ID Act and its implementation. Many of you probably have your favorites. Please do not tell us what they are in the “comments” section of this entry. This is a family publication. Real ID is ... A back door man.